Hi there! Some of you know that I’m a serious toiletries hoarder. However, I’m doing my best to use up as much ‘old stock’ as possible. And that’s why today’s post is about Imperial Leather Tempting Shower Creme with Guava and Lotus Flower, Bewitching Shower Creme with Blackberry Blossom and Wild Fig and Revitalising Grapefruit & Pomegranate Shower Cream. Now that’s a lot of bold print, so let’s get started with the actual review. Guava & Lotus Flower is not my favourite because the scent is a tad too marine and too masculine for my taste. It’s not bad, it’s just that the fragrance doesn’t tickle my fancy. However, this shower cream feels surprisingly moisturising and it is very gentle to the skin. Blackberry Blossom & Wild Fig smells quite strongly of figs. The warm and sweet fragrance is not for everybody (my husband hates it), but I think Imperial Leather managed to create a very authentic fig scent. This shower cream is just as moisturising as the guava & lotus flower one, but it gets an extra star for being pretty. Why is that? This shower cream contains micro shimmer – bewitching indeed! Grapefruit & Pomegranate is a nice one. 🙂 I love grapefruits and blood oranges, so I had to have this shower gel. The scent is very realistic and I like it. However, I would have loved it if Imperial Leather had left out the pomegranate. 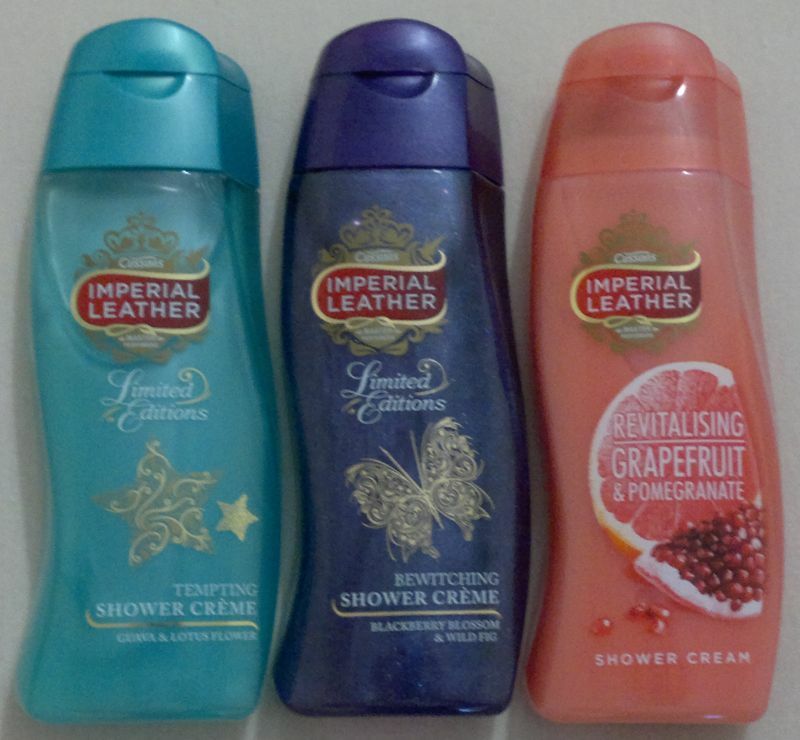 I believe that these three shower creams have been discontinued. The guava & lotus flower and grapefruit & pomegranate shower creams were briefly available in Imperial Leather’s new slim bottles, but I haven’t seen them in a while. The blackberry blossom & wild fig fragrance is now available as Foamburst. I’ve worn this mani since Thursday and I think it looks very cute. The fuchsia base shade is called Love and it’s a Boots 17 Supreme Shine nail polish. The fuzzy glitter topper (light blue and white) is called Bubblegum and it’s from Barry M’s Confetti range. 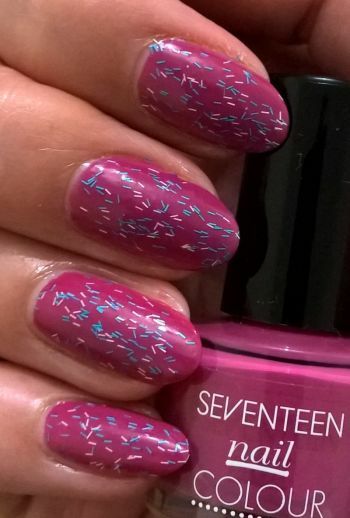 I’ve got quite a few of these fuzzy/feather/confetti top coats and I love them so much. If you’re bored of plain pink, orange or red nails, I recommend these fun toppers because they really make a difference! 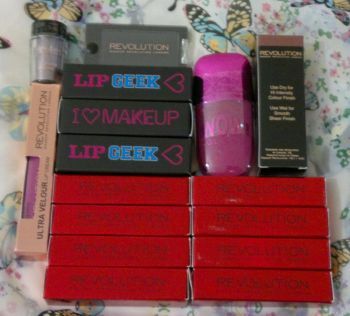 MakeUp Revolution Haul! Products Worth over £30 FOR FREE! Hi there! Just a few weeks ago MakeUp Revolution did a sensational promotion. It was something like buy stuff worth £30 and get lots of products FOR FREE! Let me show you the goodies – which items I paid for and which ones came for free. The next palettes are Unicorns Unite, Welcome To The Pleasuredome and Girl Panic. 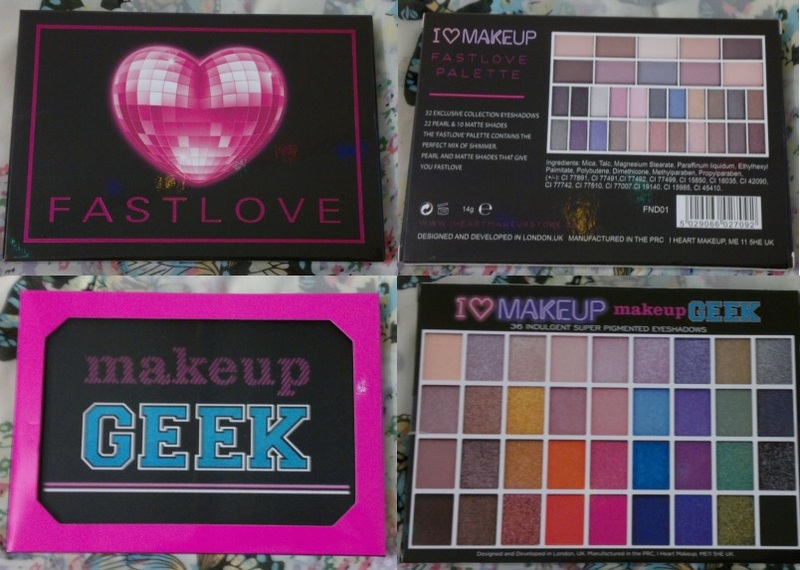 These palettes are normally £6, but MUR did a 3 for 2 promotion, so I paid £12 in total for these three palettes. Now on to the smaller products. I bought 8 liphug lipsticks (red packaging) for £1.50 each – that’s £12 in total. Everything else in the pic to the right came for free! The freebies were 3 lip geek lipsticks, a purplish WOW lipgloss, a blush stick (‘Malibu’), an ultra velour lip lacquer, a single eyeshadow (black) and a small plastic container filled with loose pigments. I won’t be using all these products, but I can give some of them away! I applied two coats of Rimmel Salon Pro 312 Ultra Violet on top of a strengthening base coat; Ultra Violet is one of my favourites. 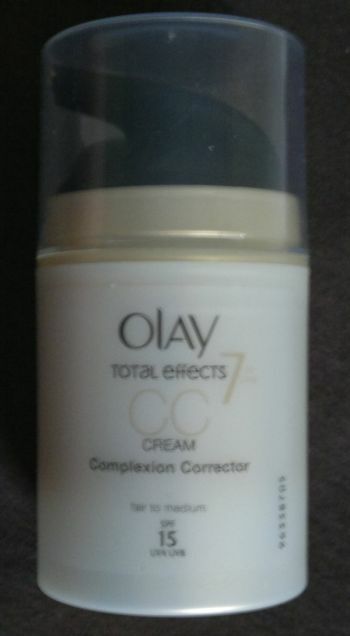 I love the colour and the formula is great too. 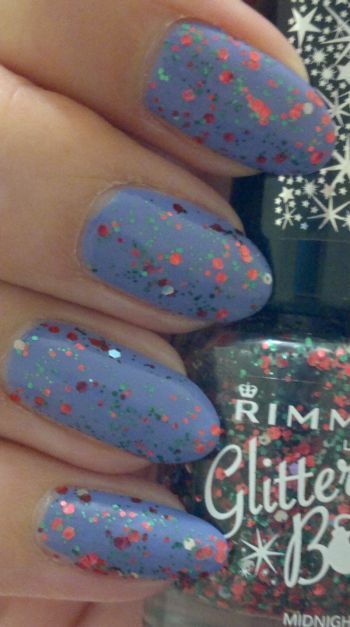 Now here’s how and where it went wrong: Once the second coat of Ultra Violet had dried, I applied one coat of Rimmel Glitter Bomb 020 Midnight Mistletoe, a Christmas glitter topper. I didn’t like the combo at all, but one of the girls at work complimented me on the ‘cute’ mani. I’m glad my colleague liked the mani, but I won’t use these two polishes together again. Hi there! 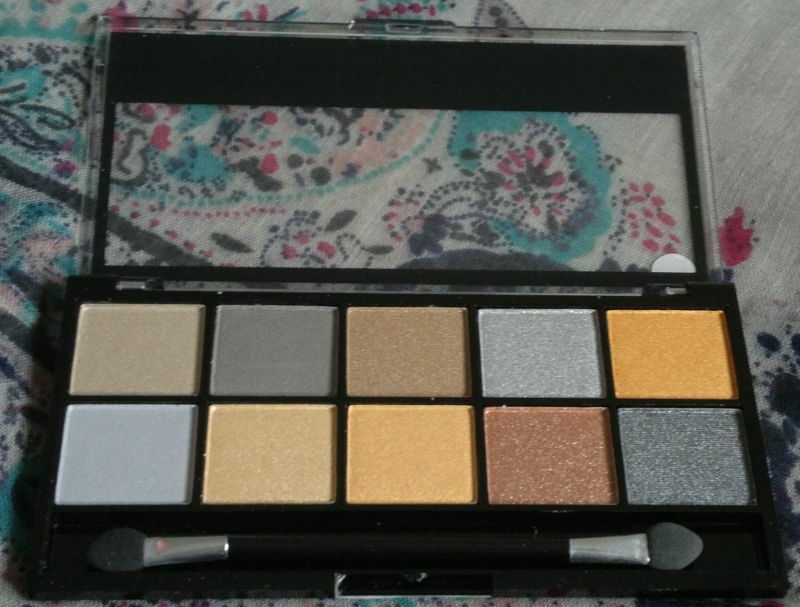 Today’s post is about one of the eyeshadow palettes I got for £1 during MUA’s winter sale – MUA MakeUp Academy Going For Gold. If my memory serves me right, this palette was launched around the time of the 2012 London Olympics. The Going For Gold palette contains ten shimmery eyeshadows in gold, silver and bronze shades. My favourite shades are 1, 3, 7 and 9 – the safe ones. 🙂 In terms of quality, these eyeshadows are exceptional. The colour payoff is insane, the eyeshadows stay put and there’s hardly any fallout. Whilst I think that some of these eyeshadows are a bit too intense for my taste (bold golds, I’m looking at you), I believe that I’ll find a way to make all the shades work for me. If you like this palette, it’s available at MUA’s online store for £4. Hi there! I’m always bargain hunting so it’s no surprise that I’m a regular at Poundworld, Poundland, Home Bargains, etc. 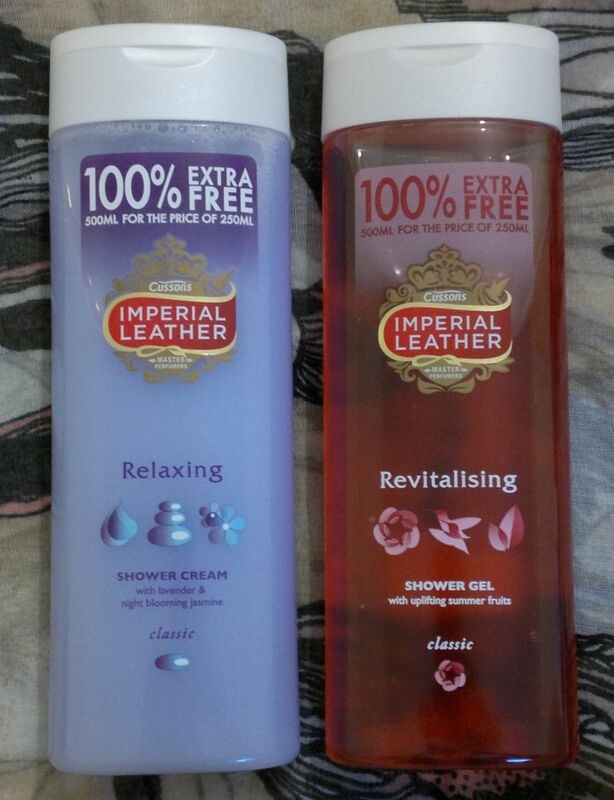 Just a few weeks ago I found these 500 ml Imperial Leather shower gels for £1. I haven’t had these before, so I had to have them now. Now meet Imperial Leather Relaxing Shower Cream with lavender and nightblooming jasmin and Imperial Leather Revitalising Shower Gel with uplifting summer fruits! I really love the Relaxing Shower Cream. It ‘s hydrating and it feels great on the skin. I also like the scent. I find most lavender scented products to smell a bit harsh, but this shower cream has a pleasant floral fragrance. Well done, Imperial Leather! The Revitalising Shower Gel smells fruity and summery – nice! However, I think this is one is one of the most drying shower gels I’ve used in the past couple of months. I think it would be OK if you don’t have dry skin, but if you do have dry skin, you won’t be able to skip the moisturiser after the shower.